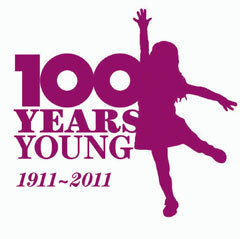 Richmond Kindergarten was one of our early kindergartens in the Canterbury area, opening of the 28th of June 1921. And like many others, Richmond has seen its fair share of changes over the last 92 years. 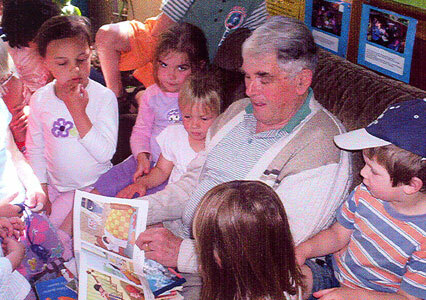 The photo above shows Russell Sears, 73, sharing a story with the Richmond Kindergarten children in 2005. Russell had his first story time with the kindergarten in 1932 when he was a kindy kid himself and came back in 2005 as a volunteer in the Story Readers Programme, to share his own experiences of Richmond Kindergarten in the 1930s. Su Blacklock, Head Teacher at the time of our centenary, had been at Richmond since 1978 and shared some of her most notable memories with us from training. Su trained in 1970/71 and she remembers her training and early days in kindergarten well, noting that things were done quite differently then to the expectations today. 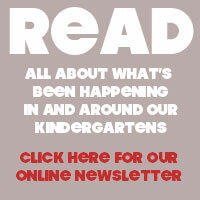 One of the greatest changes, Su's noticed has been in the technology available to children and kindergartens. With trained teachers, timetable changes and a smaller child to teacher ratio, Su says there's been changes in how the children, teachers and family interact. But while some of these small things may have changed, Su acknowledges that kindergarten's main focus has been pretty consistent over the years. “Kindergarten, since its inception, has been focused on children, families and communities, free play and the insistence on trained teachers. But other aspects are just totally, totally different," says Head Teacher Su Blacklock.